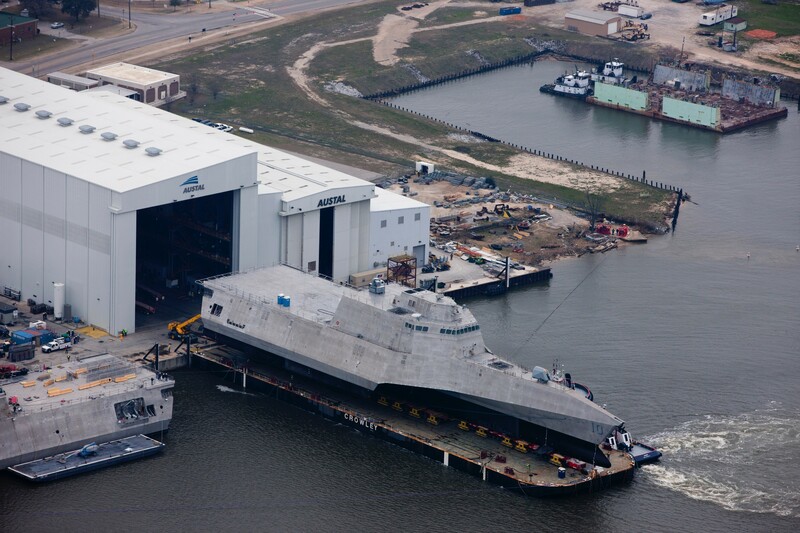 Straight from the Austal USA shipyard, the NAVY launches the USS Giffords LCS 10. It is all so in your face these days; we Americans must reach a point of complete understanding of the intentional, hostile, takeover and capture of our country. Once understood, there should be earthshaking outrage from the People, - leading to a defensive stance and unleashing a torrent of wrath aimed at the true agenda unfolding. Now is the time to explore the real reason for the Second Amendment: protecting ourselves from a criminal government. The gun controllers are blowing magic towards the constant demolition (deconstructionist) of America's Constitution and Bill of Rights while the mainstream and alternative-mainstream media are covering it up. A constant cover-up obscured with a diversional program and depending on the ignorance of the People of this land. We have gone from a country that never questioned the integrity of our Navy to interrogating their every move. Bear with me as I take you down a psychopathic railway leading through tunnels of fake stages with a troubling agenda at the end of the track. Can we even begin to put together a plot so deep it involves high treason, actors, technology, and war. 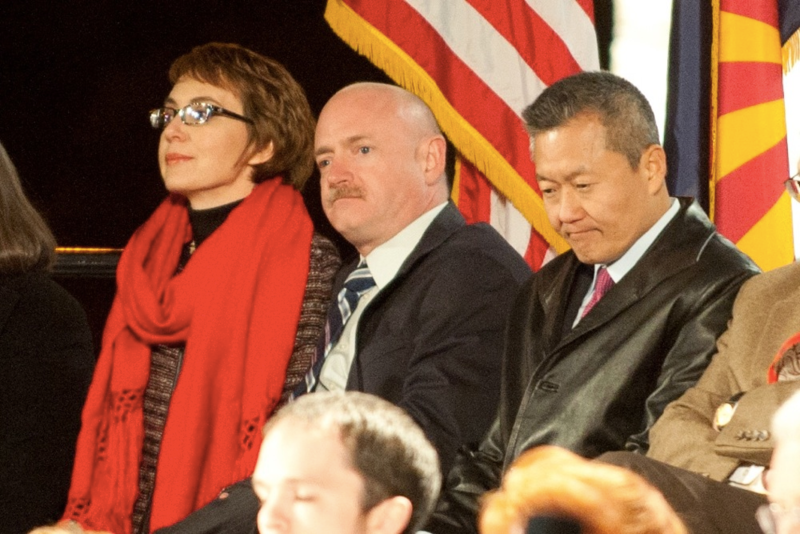 Astronaut Mark Kelly, and his jewish wife Gabrielle Giffords (former democratic member of the U.S. House of Representatives) and their gun confiscation stooges are behind the scenes plotting a giant gun grab, while they continue to play out their roles on a fabricated stage here in America. A dubious and shady secret plan unfolding to include questionable rewards reaped by the NAVY and NASA following an alleged 2011 shooting with a very murky storyline. However, because the nation was under mind control, like the trance induced by 9/11 propaganda, the majority of the country was unable to see the real meaning of the shooting. Including mental illness, gun confiscation, heroes and victims; this shady plot is about to unfold. 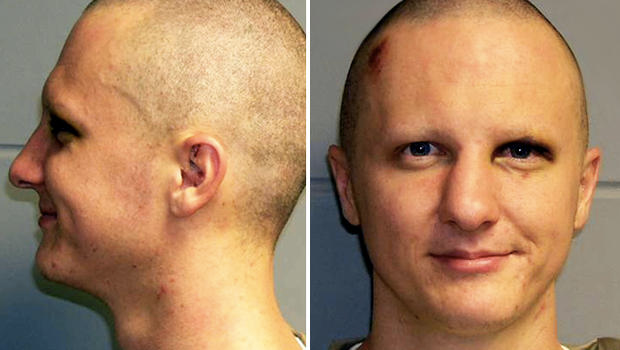 Gabrielle Giffords, was allegedly shot in the head at a Safeway store by Jared Lee Loughner in 2011 during a constituents meeting. Twelve additional people were allegedly injured and six people were killed including U.S. Federal Judge John Roll; a judge who upheld the Constitution and reversed the Brady Bill (a previous gun confiscation plot). Mainstream and AP Press played the storyline off by professing Giffords was the intended target; however, many suspect Judge John Roll was the real target as he would have been a barrier in the present plot to confiscate firearms from Americans. Under closer scrutiny, it appears Giffords was also an intended target, not necessarily by Jared Lee Loughner, but by the NAVY and NASA for medical technology and LCS-10 warships. An avenue to merge together a lucrative agenda while stripping Americans of their gun rights. However, the 2nd Amendment judge's murder was swept under the rug and Giffords stole the stage. The NAVY and NASA continue to gain from this event and are strong supporters of an astronaut/employee, portrayed as a 'hero' to the American People, who is promoting gun confiscation in America: Mark Kelly is a traitor and disgrace to this country. Meet today's Captain Tony and his wife Jeannie from the hit TV series, I Dream of Jeannie! Most intriguing is what has transpired with this not so new medical technology. How convenient South Korean born Dr. Peter Rhee was an attending trauma surgeon for a team who performed the suspended animation procedure on Giffords in order to save her life. After closer research, Rhee has deep ties to the NAVY and a close personal interest in the suspended animation technology. He is the Chief of Trauma and professor at the University of Arizona. He has published over 140 medical journals, held appointments as Director of Navy Trauma Training Center, and is a retired Navy Captain of 24 years of active duty. Rhee also serves on the National Steering Committee on Trauma and Injury and Tactical Combat Casualty Care. He also serves on advisory committees for the FDA's blood products. Following the 2011 shooting, Rhee pushed for FDA approved clinical trials of suspended animation medical procedures. Rhee lobbied for a whole set of clinical trials and the ARMY began funding feasibility trials in Baltimore, Maryland. In 1998, he was selected to accompany President Bill Clinton as his designated surgeon on a trip to China. Another interesting fact regarding the trauma team surgeons was Dr. Lemole, another surgeon who played an important role in allegedly saving Giffords life. 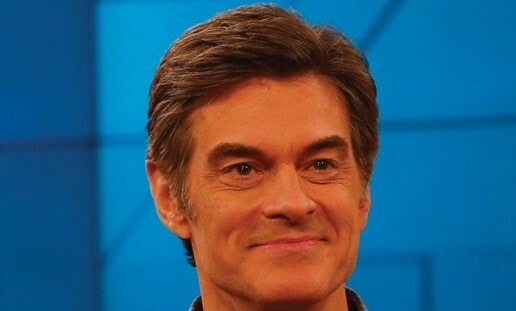 Just for record, his daughter, Lisa Lemole, is married to Dr. Mehmet Oz. The mainstream media doctor! Stupefying! SpaceWorks Enterprises, Inc. ((SEI) is an aerospace engineering concept design and systems analysis firm focusing on next-generation space transportation systems, future technologies, human and robotic exploration of space, and emerging space markets and applications. SEI's advanced concept design and development work helps our customers envision the impact of future technologies, understand the feasibility of proposed space missions, and make strategic decisions regarding future markets. As a promising solution for spaceflight for long duration, the idea of suspended animation with interstellar human spaceflight is still a long way off. Cryo-preservation and restoration, with recent medical progress, research, and funding have NASA and their contractors hopeful for future sustainable missions to Mars. 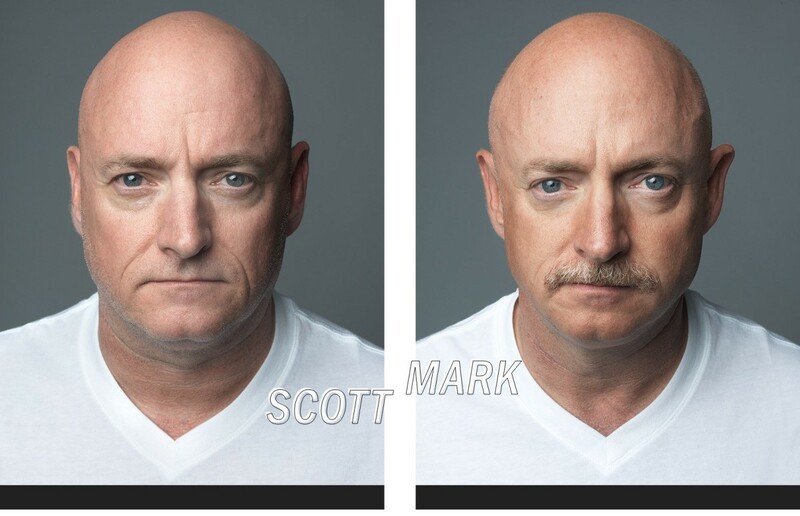 What is even more bizarre is Mark Kelly's twin brother, Scott Kelly is off to the International Space Station for an entire year to contribute to the cause in many ways. 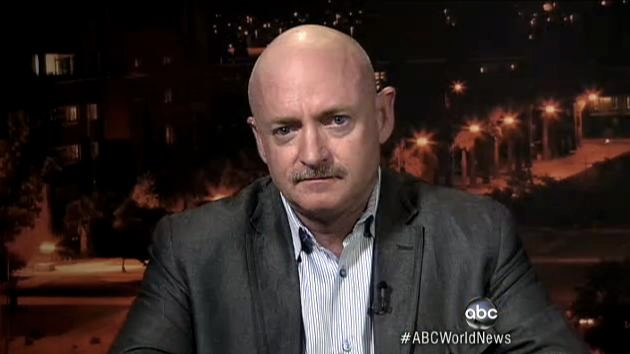 Meanwhile, brother Mark Kelly is at home trading our freedoms for a giant rabbit hole of lies and deception. NASA continues funding and supporting him as a spokesperson and projects him as some sort of real life super-hero to the sleeping sheeple of this country. In reality, he appears to be a traitor and preys on the people with his attestation of being a 2nd Amendment supporter, while forming a PAC to push for more domestic gun confiscation; all in the name of responsible gun control. The Defense Advanced Research Projects Agency (DARPA) also gains from suspended animation technology as they have invested in immortality consisting of hyper-sleep studies to one day bring humans to a "zombie-like" form of hibernation. Motivations behind the zombie sleep studies are based around emergency trauma and super soldier projects for the constant and on-going banker wars and battlefield agenda. Using pigs as test subjects, turning the animal into a zombie can be "the difference between life and death for wounded soldiers on the battlefield." Hummm, zombie, could such technological studies lead to other not-so-nice business plans in the future consisting of practices like zombifying and placing inmates into hibernation to serve their prison sentences..? DARPA loves war, so why not use this technology for foreign and domestic prisoners of war also? Thoughts to ponder. You never know with DARPA as they are always looking for ways to make money and mind control the nation, just study their war game technologies. Yes, it is true - in 2012, following the shady shooting in Tucson, Navy Secretary Ray Mabus dedicates a whole new line of LCS-10 warships to Gabrielle Giffords for her alleged unwavering courage. The bizarre NAVY dedication was presented 'upside-down' and a new line of littoral warships were named after Gabrielle Giffords. A new 'female force' comes to life. It was all presented on a cracked stage Yes, a cracked stage. Upside-down and cracked in half, what a jaw-dropping ceremonial performance! See for yourself! The crazy upside-down dedication of warships with Ray Mabus, Gabrielle Giffords, Mark Kelly, Roxanna Green, Ike Skelton, and a cracked stage! YOU CANNOT MAKE THIS STUFF UP! Roxanna Green, is the sponsor of the ship. She is the mother of the little 9/11 girl (born on 9/11), Christina-Taylor Green, who was allegedly murdered at the hands of Jared Lee Loughner. Her father is John Green, a scout for the Los Angeles Dodgers and son of Dallas Green, former manager of the Philadelphia Phillies and 1980 World Series Champions. Christina-Taylor Green was the girl the town of Tucson honored by raising the original 9/11 flag on the corner of Ina and Oracle Street in her name. She was also honored with the installation of a memorial at the James D. Kreigh Ball Park, and by renaming the Canada del Oro linear river park after her. Obama even blew through Tucson and held a massive memorial in the name of the 9/11 girl. Why Gabby and Roxanna? Why not name the ship after Federal Judge John Roll? He defended the country against a previous hostile gun grab plot! Why the special powers? The sponsor guides the ship. A sponsor of a Navy ship means, "her spirit and presence guide the ship throughout it's service and life," according to Wikipedia's ship commission pages. Other journalists have commented, "How on earth is Christina-Taylor Green's mother the ship's sponsor?" The handy 1933 Oxford University Dictionary, page 1979, defines the Sponsor as, "to be surety for" and to "support strongly." Hummm, just where is the Christina-Taylor Green Memorial funds and foundation money really going? During my initial investigation into the 2011 Loughner shooting, there was strong evidence the shooting event appeared to be planned as early as 2007. Planned to trick the nation and use Loughner as a patsy to take the blame for the assassination of a Second Amendment Judge and change the laws to include a legal way to forcibly medicate prisoners as Arthur Clemens Jr. points out in his article, The Loughner Precedent and the Spectre of a Stalin Style Purge . Most interesting is while investigating in Tucson, I was able to obtain confirmation in Christina Taylor Green's elementary school she attended from K-3 grade. I also confirmed prior to the shooting, Mark Kelly, had personally visited the school as he left a signed photograph behind and following the shooting, Nasa had chosen the school in Tucson for their Downlink. However, the school denied Nasa chose them because of the death of the alleged 9/11 girl but one has to wonder. It was discovered through follow the money research, Christina-Taylor Green's mother trademarked Christina-Taylor Green products on 9/11/07. Over three years prior to the 1/8/11 shooting. Roxanna Green now sells or had sold Christina-Taylor Green products for the Christina-Taylor Green Memorial Foundation started on 1/10/11.. Most revolve around butterflies and 9/11 - We must 'never forget'... yes? Although the Nation has been sympathetic believing Gabby was allegedly shot in the head and Roxanna allegedly lost her daughter, it makes no sense the Navy would name the ship after her. In fact, many people of this country were upset at the Navy's decision on the LCS-10 line of warships considering her and her husband Mark Kelly's goals are to confiscate guns from the American people in the name of responsible gun solutions. So, give her the ships armed to kill many people as she and her husband work towards gun confiscation of American's guns. The Navy gains Littoral warships to allegedly protect us against threats of war but yet the same woman they name the ship after (and her astronaut husband) are working towards eliminating high capacity magazines, assault weapons, and expanding background checks. Hummm.... sounds reasonable and non-mental... Yes? Former Rep. Ike Skelton, D-Missouri, attended the Pentagon ship-naming event to support his friend and former colleague, calling it a "magic moment." "Ship-naming is important," Skelton said. "Ships take on the characteristics or character of the name of the ship." Wow, if Skelton is right, we as American's have a lot to look forward to... Yes? "This lady will be remembered as a warm, unselfish, dedicated, most of all courageous lady," Skelton said. "I'm proud to call her my friend and the Navy, I know, is especially proud to call this ship the USS Gabrielle Giffords." It is all so in each and every one of our faces as American Citizens.. While many in the media are on their bullhorns preaching to the world Diane Feinstein is the biggest gun grabber, Giffords and Kelly sneak off into the shadows and continue their gun grabbing efforts against the People, while pretending to be spokespeople for responsible gun ownership. Meanwhile, NASA puts Mark Kelly and his brother out in the spotlight press releases as some sort of heroes. Heroes our children are being taught are the new spokespersons for new responsible gun control. One brother portrayed as a hero astronaut flying space missions so we as a nation can continue feeling as if we have super-heroes to save us from our own demise, meanwhile, the other brother is preaching we need to limit arms to the American People. Giffords and Kelly are the founders of the organization Americans for Responsible Solutions (ARS), a 501(c)4 and Americans for Responsible Solutions PAC, a federal political committee. These organizations focuses on so called responsible gun ownership and gun violence. Their usual excuses for more gun control has been the Loughner shooting and the Sandy Hook elementary shooting. Most Americans are now aware these shootings (as well as others) are rife with flawed story-lines, and are likely outright fakes or intelligence agency created false flag events or worse, events entirely fabricated in the mainstream media and supported by the likes of AP Press and mainstream-alternative news-media, with the underlying agenda of gun confiscation. ARS claims their goals are to expand the criminal background checks, stop gun trafficking, as well as limiting the ability to purchase high capacity magazines and assault weapons. Using safety as a fabricated reason to continue the lies to the average American, we are being entertained in front of a fake stage and it's a horror show created to force us to beLIEve we need fabricated super-heroes to control Americans weapons. It is plain and simple - the group has a goal of gun confiscation rather than "responsible gun solutions. According to their website, ARS has a goal "to encourage elected officials to stand up for solutions to prevent gun violence and protect responsible gun ownership." However, when one uncovers the truth, one sees the organization is a cover-up for a large scale gun grabbing movement, using 'victims' as their source of marketing. It's in your face America, these people are hiding in a shadowy government agenda to change our laws and our natural right to self-defense, including the right to bear arms. As you can see below, these mentally ill people beLIEve they can prevent gun violence by taking away freedoms. Clearly, the Americans for Responsible Solutions PAC is to be traitors to this country and to be a part of a larger plan which involves the NAVY and NASA as well. According to their site, they claim one of their solutions is to stop gun trafficking. Interestingly enough, Gabrielle Giffords' last ACT in Congress was sponsoring H.R. 3801 the so-called Ultralight Aircraft Smuggling Prevention Act. The bill was signed by President Obama on February 10, 2012. This bill increased criminal penalties for those who smuggle drugs from Mexico into the U.S., and in addition, it adds provisions to Section 1590 of the Tariff Act of 1930, which adds "conspiracy" to commit drug smuggling by aircraft with increased penalties of "intentional committing" such an act using an aircraft. In addition, the bill appears to address the conspiracy by certain elements of the federal government to smuggle drugs and weapons into the U.S. through zones in Arizona which were specially created under Janet Napolitano, when serving as governor of Arizona, later to become Secretary of Homeland Security. Giffords's bill also calls for the Defense Department to "leverage" its expertise on Homeland Security, particularly the U.S. Customs and Border Protection, to "detect, track, and engage illicit trafficking" across the U.S.-Mexican border. "Every year, hundreds of thousands of guns are diverted from legitimate commerce and then recovered at crime scenes - in large part because law enforcement does not have the tools it needs to stop the flow of guns to criminals." Really Gabby and Mark? Did you stop to consider how DOJ cartel Eric Holder and his minions are responsible for selling guns to Mexican drug cartels and allowed thousands of guns to walk into the hands of criminals? Maybe Gabby and Mark Kelly should take some time and research the Hoax of Sandy Hook, Operation Gun Runner, and Operation Fast & Furious. Ignorance is not going to fly any longer here with Americans. Furthermore, ARS site claims the "law enforcement does not have the tools it needs to stop the flow of guns to criminals" but yet, these same law enforcement agencies gain each year from federal grants to occupy the streets of American communities like a growing soviet style mafia, only interested in pretending there is a war zone here on the home-front. Another form of super-hero syndrome aka 'The Lucifer Effect' as Jack Mullen points out in his article, DEESCALATING THE POLICE. This gun confiscation PAC plot also states, "One percent of licensed firearm dealers account for 57 percent of guns recovered in crimes. Law enforcement can put such offenders out of business, but the police and prosecutors need the tools to do so." How about Dennis Burke. He is well known to Gabrielle Giffords and his gun running scandals run deep. Arizona US Attorney, Dennis Burke, helped mastermind and push through the 1994-assault weapons effort, which the dead judge deemed unconstitutional, and is a regular donor to the Obama administration as well as other democratic parties. He was primed for consideration with a staff position in the Obama administration. He initially was in charge of prosecuting Jared Lee Loughner's case following the shooting until his resignation over the 'Fast & Furious' gunrunning scandal. As I exposed in many articles previously about the gun-grab plot, Dennis Burke resigned abruptly in the latter part of 2011 when his connection to the 'Fast & Furious' gun running scandal began to unfold. Congressional investigators and the internal Justice Department began to inquire about the Arizona federal gun-trafficking investigation leading to thousands of guns flowing into the hands of criminals across the border to Mexico. He was ridiculed and assumptions were made throughout the media Burke was trying to "walk in the shoes" of Janet Napolitano and was seeking a federal prosecutor's job to perhaps, one day, become governor of Arizona. Interestingly enough, as the readers already know, Judge John Roll had overturned the Brady Bill on the assault rifle ban. Maybe Giffords' last Act in Congress was a ploy by the real criminals to be able to investigate and pick and choose who they really want to take the fall. So, as this hostile gun grab plot aims to label American gun owners as violent offenders, Dennis Burke and other scandalous criminals get away and hide behind their attorney credentials and non-profit organizations, like this one, which are using false reasons and fake hoaxes to get American guns, while promoting the victim-hero scenario. Can you see this dangerous 2nd Amendment heist People? When the criminals get their way and outlaw and confiscate America's guns the criminals will next have their way with the American people; history is replete with this paradigm. 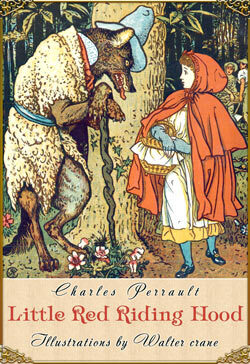 Even little Red Riding Hood could see the wolf's teeth, though it was dressed like a harmless loving grandmother.